The natural gas industry has recognized that dehydration is necessary to ensure smooth operation of gas transmission lines. 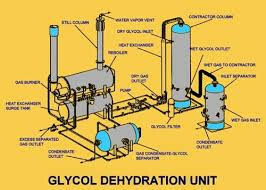 Dehydration prevents the formation of gas hydrates and reduces corrosion. Unless gases are dehydrated, liquid water may condense in pipelines and accumulate at low points along the line, reducing its flow capacity. Therefore, the removal of the water that is associated with natural gases in vapor form is one critical step in gas processing scheme. Several methods have been developed to dehydrate gases on an industrial scale. The three major methods are: direct cooling, adsorption and absorption. Glycol and methanol injection, glycol dehydration contactor, and glycol regeneration are important issues in gas production operations.